An ancient proverb says, “The crown of old men is the grandsons…” Proverbs 17:6 If this proverb is true, (and I’m sure it is) then Jim is wearing a golden crown studded with the finest jewels, better than his usual Burger King crown! For the bewildered and unbelieving, allow me to explain. When our two eldest youngsters were viewing “Mork and Mindy”, the 70’s television show starring Robin Williams, we had a family discussion with an odd outcome. The two clever-minded children – Chet and Jessica – decided on Grandparent names that we would assume when the grandchildren arrived far into the future. They knew I wouldn’t be a Granny, and with grand laughter they said my name should be “Mother Superior.” With higher authority, I ruled that one down and negotiated “GranDeb” instead. Moving on to unsuspecting Jim, they said his name would be “Na Nu Na Nu”, and so it stuck. Now imagine Jim answering to this name in a grocery store or an assemblage of intellectuals (can’t see that one happening?) when his pretty, petite, blonde granddaughter calls! Soon Daniel will shout “Na Nu Na Nu” at the top of his boyish lungs! Isn’t he just the most beautiful grandson?!! Do your grandchildren have odd names for you? Could you share some of your stories in the “Reply” area below? Special thanks to my friend Dianna who reminded me of the proverb. GranDeb and Na Nu flew to California, upping the state’s oddity population with two Alabama alien visitors. We held Daniel, watched Daniel, pushed Daniel in the stroller and walked around with goofy grins on our faces to match our names. I introduced Daniel to antique shops at Orange Olde Town Historic Center with the exception of those with “No Baby Buggy” signs. He seemed most impressed with the cute shops with French themes! I promised Daniel that we would sit at a bistro table together one day in Paris, as soon as he grows a little more. Visit PARIS IN A CUP for gourmet chocolates, teas and French macarons. “Yes, Daniel, when you are a bigger boy you can have all you want. Try the coconut and pistachio. Chocolate-caramel with sea salt is extra special! GranDeb knows best! Guess who bought Kickapoo Joy Juice. Yes, NaNu swizzled it down while Daniel had his own brand of nourishment. I rarely find this Blood Orange drink, so I was delighted! I saved the bottle for a bud vase. This picture is especially for our friend, Miss Kitty. Kitty, show it to your disbelieving doctor. NaNu recommends it highly! I believe Ms. Short found much more than she expected. In her two-page article, I read interesting history and recommendations for The Tutwiler Hotel and several restaurants. I will definitely check out the French restaurant when I’m in Birmingham again. Chez Fonfon, 2007 11th Ave. South. Thanks, Alice! Ya’ll come back! Arrange your visit when Daniel is visiting GranDeb and Na Nu Na Nu in Opp, Alabama! Peppermint roses on an arbor. What could be more romantic? “NaNu, would you add this to your to-do list?” I adored the flowers at this California B&B! Daniel will help water the roses when he is a big boy, wearing his jeans and boots. Thank you for your support. Enter your e-mail address for a free subscription and never miss a post! Do you know a special grandmother who would enjoy this story? Why not forward the link to her right now? Or, is there possibly another Na Nu twin out there who could identify with Jim? Why not surprise him with this story? Let me give a little grandmotherly advice. 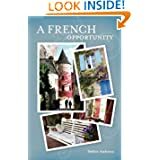 Buy A French Opportunity and enjoy! Daniel agrees. Congratulations on the new addition to your family. He is a precious looking little guy. I love your nicknames, especially Jim’s. It is totally in character for him to have a granddad nickname like Na Nu Na Nu. Now, let’s wait and see what yours and Carlos will be. How precious. I have a nephew named Daniel. I loved Mork & Mindy when I was little. We are so happy with this precious new bundle – our special grandson. Yes, those old television shows were great. Wish the producers would copy them and keep them clean and truly entertaining. I am still catching up on your past articles & so just read this one today. Our “grand” names are not as catchy as yours!! lol But I did spend a lot of time thinking & asking other people for ideas in the months leading up to the birth of our first grandchild. We finally settled on “Meme” & “Papa”. It has stuck & we are on our 3rd grandchild! I’m glad that you had time to visit here, and I hope you found a bit of enjoyment. Congratulations on 3 grandchildren. I know you enjoy hearing them call you, whatever names they select since it might not be the one you had in mind. We are very excited about seeing our two!! It’s always great to hear from you.